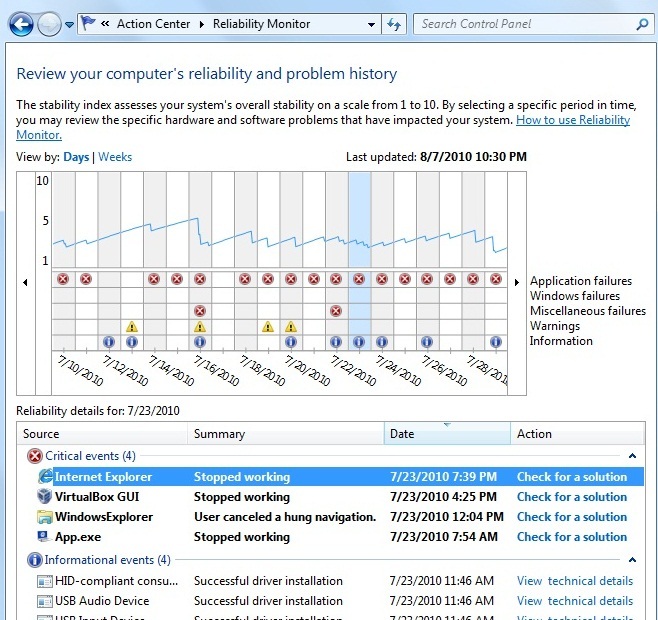 Reliability Monitor is an advanced tool that measures hardware and software problems and other changes to your computer. This helps IT professionals better manage the stability of machines in their organization. Reliability Analysis Component (RAC) aggregates, analyzes, and correlates problems at the operating system and application levels. It calculates a stability index that indicates overall system stability over time. RAC also keeps track of any important changes to the system that are likely to affect stability, such as Windows updates, application installations, and driver installations. You can Invoke Reliability Monitor perfmon /rel and pressing ENTER in the command prompt. You can also search for Reliability monitor in the Control Panel. When you click on the ‘View Reliability history’, you will get this below dialog. This is actually refreshing and generating the report. This will open the Reliability Monitor. Users can view RAC data via the Reliability Monitor, which displays data collected from RAC in a stability chart and correlates the computer’s stability index with important events that are likely to affect stability, such as driver failures and software installation. When you double click on any of the events, it would give you the detailed information on how that event occured. 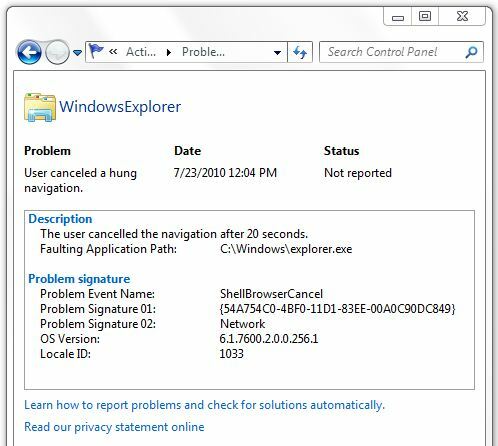 For eg: I see a WindowsExplorer event, which gives the Summary information that the ‘User canceled a hung navigation’. When I double-click it, you can see this below detailed information. 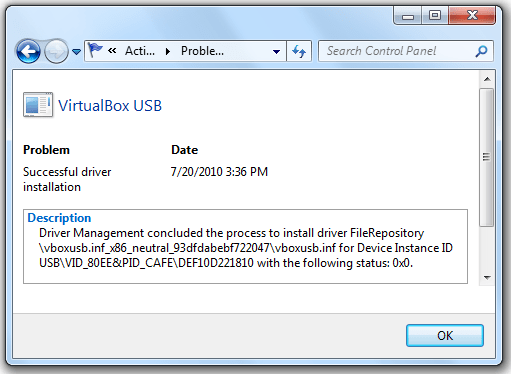 Another example for an Successful Message – Let us look the details of the VirtualBox USB Driver Installation message. If some applications events triggers an error, you can check for a solution online and also send the report to Microsoft. If the solution is not found online, they will appear in the Action Center when the information in available later. Posted in Enterprise Tech, How-to, Microsoft, Tools and tagged Best Practices, Tips, Tools, TroubleShoot, Windows 7. Bookmark the permalink.